This post is based on the Infrastructure Matters Socialcast panel discussion that focused on midsize business cloud infrastructure. The panel included in this Socialcast is host Paul Gillin, Scott Hawkins, Cal Braunstein, and John Alday. 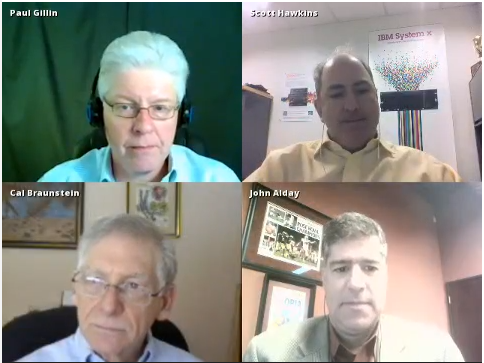 The Infrastructure Matters Socialcast is a one-hour video discussion about key topics facing midsize businesses concerning IT infrastructure, infrastructure outsourcing, cloud solution costs, and the changing nature of information technology. Paul Gillin – A veteran technology journalist and a thought leader in new media. Since 2005, he has advised marketers and business executives on strategies to optimize their use of social media and online channels to reach buyers cost-effectively. Cal Braunstein – Chairman/CEO and Executive Director of Research at Robert Frances Group, Inc. (RFG). RFG provides concierge advisory, consulting, and research services to business technology executives as well as to marketing/sales management for companies that provide IT communications services and products. Scott Hawkins – IBM’s Program Director of X86 and Pure Systems Solutions organization. John Alday – CEO of Cima Solutions Group (CSG). CSG delivers reliable and efficient IT solutions that create financial value for their clients. CSG offers its clients technology solutions from manufacturers such as IBM, VMware, Google, FalconStor, Compellent, Scale, and others. The first major topic covered by the panel is the question of infrastructure “Build or Buy”. Midsize businesses are focused on cost-cutting and optimization to better align themselves with today’s market. Some of those cost-cutting activities include making decisions about consolidation, virtualization, cloud, and outsourcing. In the past, companies have built their own infrastructures and found that their systems were expensive to maintain, expensive to manage, and were vastly underutilized. Business discussions then turned to virtualization, optimization, and outsourcing. The problems facing midsize businesses in this are a general lack of expertise in moving away from traditional computing models, a sticker shock of moving all infrastructure to an outsource provider, and a fear of using cloud-based solutions for a variety of reasons including cost, security, and control. Infrastructure: On Premise or Off? Then came the question of developing an on premise solution or opting for off premise. In other words, depending on where your business is in its life cycle, the correct answer might be different. For example, if your business is a startup or in its infancy, your best option is an off premise, cloud-based solution. You haven’t yet committed resources to on premise infrastructure. Mature businesses will likely develop in-house cloud solutions to better serve their internal needs as well as their customer’s requirements. It is every business in between those two that creates the dilemma, but the consensus is to implement a hybrid solution, which means to migrate some infrastructure to a provider as systems “age out”. This hybrid approach makes sense for most businesses. Financially, migrating toward a hybrid infrastructure means that business critical systems will remain in-house, while other systems will be placed at a cloud provider location. Think managed service providers (MSPs) here. Unfortunately, as the panel noted during the discussion, sometimes businesses find that there’s a cloud cost “creep” involved in migrating to an outsourced model. Cloud cost creep is the upward spiral of costs associated with moving your infrastructure, especially storage, to the cloud. Storage costs are still not where they need to be for a mass exodus from the private data center to the cloud. However, there are currently available solutions for businesses to take advantage of, such as “pay as you go” models and metered usage. The pay as you go scenario involves using cloud infrastructure on an as needed basis and only paying for what you use. Metered usage gives businesses the opportunity to charge back cloud costs to clients, to business units, and to individual teams. It also provides an excellent means of tracking usage per application so that businesses can make future deployment and support decisions based on cost vs. benefit of their solutions. The panel brought up an interesting topic about involving IT when making decisions on business direction. The problem with business integration with IT, historically, has been IT’s reluctance to become involved and the lack of understanding, from the business perspective, of what IT actually does. The solution is fairly simple: Integrate IT into business direction discussions, without the use of jargon, and empower the IT staff to focus more on the business instead of just its niche piece of the company’s operations. Is the Cloud Changing the Culture of IT? Cloud is changing IT’s focus from its traditional role into a more “services” culture. There’s a lot less focus on hardware, maintenance, and management and more time spent on business and providing service to its customers. People skills are now more valuable than technical ones. The reasons for this are not surprising given that hardware is getting “smarter,” automation is more available, management is centralized, virtualization and cloud infrastructures are more prevalent, and businesses now want employees who are more in tune with customer’s needs and the forward movement of the business. The ultimate IT staffer will not only have an understanding of services and architecture, but also about business needs, such as cost-cutting, optimization, and intelligent outsourcing. VARs will also have to change their focus from providing a combined hardware/software/consulting solution to businesses with a service and consulting role. As the days of individually owned hardware come to a close and MSP and data center-owned hardware increases, VARs will have to alter their business models to partner with those providers. Currently, MSPs and other providers concentrate on supplying infrastructure, environmental protection, and maintenance and leave most of the consulting and software solutions to VARs. Your next steps in looking at your infrastructure are to evaluate where you are from an efficiency perspective. Look at your utilization. Look at your infrastructure resiliency. Look at your overall technology. Extreme advances have been made in the past five years in power consumption, speed, virtualization, and management. If you don’t have the expertise in-house, seek out a solution partner and find out what’s available to you.